The 2015 Fall semester has been busy and exciting for both FIRE staff and members of our FIRE Student Network (FSN). FIRE’s campus outreach team has grown in the past few months in order to serve the ever-increasing number of FSN members and to satisfy student demand for more face-to-face interaction with FIRE staff. Tyler Coward, FIRE’s Campus Coordinator, spoke at nine different schools during a 12-day tour through California in November. He traveled to 27 colleges and universities between September and December. Our Speakers Bureau has sent FIRE staffers to dozens of colleges and universities across the country, reaching hundreds of students. FIRE also launched the FIRE Debates series in an effort to encourage lively discussion on our nation’s campuses. FIRE Debates show students by example that open inquiry and debate is healthy, productive, and fun. FSN members Emilie Watson and Andrew Zeller from Purdue University were instrumental in pushing Purdue administrators to reform speech code policies and eventually earn FIRE’s “green light” rating. After Purdue was awarded a green light speech code rating, Emilie and Andrew hosted a panel discussion about the importance of protecting free expression on campus with Professor Geoffrey Stone of the University of Chicago and FIRE’s Azhar Majeed. Students at the University of Alabama hosted a “free speech ball” event, where they encouraged other students to write whatever they wanted on a gigantic inflated beach ball. 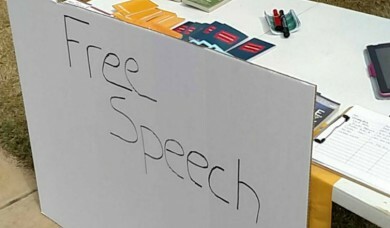 The brightly colored beach ball attracted the attention of many, and FSN students were able to educate members of the campus community about the importance of protecting speech rights on campus. How are students supposed to feel empowered to share their honest opinions on social issues, when they run the risk of being accused of ‘undermining [UCSB’s] culture of inclusivity?’ A true commitment to dialogue would involve a willingness to engage even the most objectionable opinions. It sounds more like UCSB wants a monologue on these social issues, not a dialogue. FIRE also designed brand-new pocket constitutions for student activists on campus. Since September, FIRE has mailed approximately 5,000 constitutions to students across the country. FSN members distributed constitutions to their fellow students to help facilitate discussions about freedom of speech on campus. Jeremiah Baky, an FSN member from Troy University, helped distribute our pocket constitutions at a free speech event at the University of Alabama – Birmingham. Below is a photo of their table from the event. The FIRE Debates series brought leading figures to colleges and universities for Oxford-style debates. The debates feature controversial topics and are relevant to today’s students. We hope FIRE Debates will generate greater knowledge of and support for free inquiry and open debate, thereby enlisting more and more student activists to join our efforts to end campus censorship. FIRE’s campus outreach team was on the ground for several days leading up to the debate, getting to know students, talking to them about the importance of free speech on campus, and spurring discussion about the debate topic. FIRE was able to build a relationship with Texas A&M’s campus community thanks to our debate partner, Aggie Agora, a nonpartisan campus group dedicated to facilitating public discourse and civic engagement on Texas A&M’s campus. In addition to the debate, FIRE staff presented workshop sessions, spoke to classes, and coordinated with the Texas A&M Young Americans for Liberty chapter to facilitate free speech events. FIRE staff enjoyed getting to know the students, staff, and faculty at Texas A&M and appreciates the hard work of on-campus organizations like Aggie Agora and Young Americans for Liberty (pictured with me, second from left, below) to create an environment where open debate and dialogue on difficult topics is encouraged. The debate drew nearly 300 students and elicited media coverage from news outlets such as Forbes.com. The second debate of the series was held on November 2 at George Washington University, in partnership with Intelligence Squared U.S., the nation’s premier debate organization. Four debaters argued whether college students should be allowed to take “smart drugs.” This debate drew hundreds of participants and started a lively discussion on campus. FIRE staff also had the opportunity to connect with college debaters from across the country at a debate tournament held at GWU. FIRE sponsored the second round of the weekend tournament, where debaters tackled the issue of political correctness on campus. FIRE staff helped judge the debate as well. The FSN enjoyed enormous success this fall semester, all thanks to our fantastic students. We’re looking forward to working with FSN members as they continue to promote and defend freedom of speech and expression on campus. FIRE staff members are already booking trips to schools for next semester, so if you’d like to host a speaker, be sure to submit a request through our Speakers Bureau.